Each month on a Tuesday evening, The Plimmerton Boating Club becomes the venue for Plimmerton Inner Wheel’s monthly gatherings. 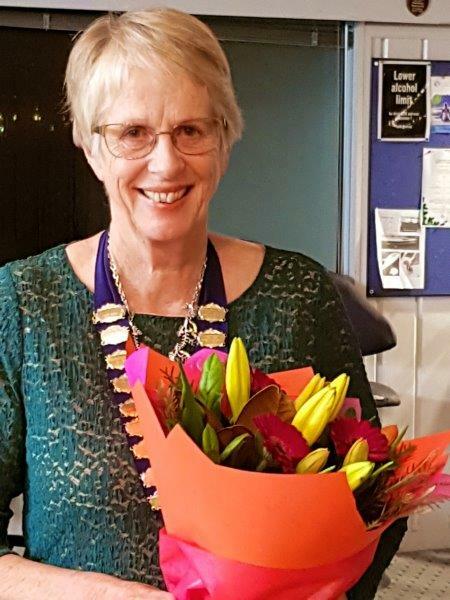 Incoming President Janet Reidy says the club is in excellent heart with a membership of 65 and a waiting list of prospective members. Formed in Oct 1989, the Club was originally affiliated with the Rotary Club of Plimmerton. While the link remains strong, these days many of Inner Wheel members do not have a direct relationship with a Rotary Club member. Inner Wheel undertakes some fundraising each year on behalf of Inner Wheel New Zealand. For the current year, the ‘Look Good Feel Better’ charity will be the beneficiary of their efforts. This charity helps cancer sufferers to face their condition with confidence. Inner Wheel Plimmerton also fundraises for local charities and over the years many local charities have benefited from their efforts. Janet has worked hard at the Club over the years. She has already served a term as President in the 2012-2013 year, also serving as Treasurer. She had recently received the Inner Wheel Honoured Active Badge for services to the club. Janet’s main goal for her year is to ensure the Club remains strong and that every member really enjoys their association with Inner Wheel. Original generation time 1.4816 seconds. Cache Loaded in: 0.0381 seconds.